Russ Brown 2019 Bike Giveaway: Win a HARLEY-DAVIDSON FXLR LOW RIDER! We’re gearing up for our next bike giveaway: a vivid-black Harley-Davidson FXLR Low Rider! To enter the giveaway, find us at the events listed below & sign up for BAM or, if you’re already a BAM member, update your information and you will be entered to win! Winner need not be present at time of drawing, but the party will be HUGE! The Legendary Buffalo Chip Campground turns 35! Chuck Koro, Managing Partner of the Russ Brown team, talks to Woody Woodruff about how “Best Party Anywhere,” will be going full throttle to celebrate this landmark year. Similarly, Russ Brown Motorcycle Attorneys celebrate over 40 years of fighting for motorcyclists and the freedom felt on two wheels. Meet our 2017 Bike Winner, Larry Dvorak! 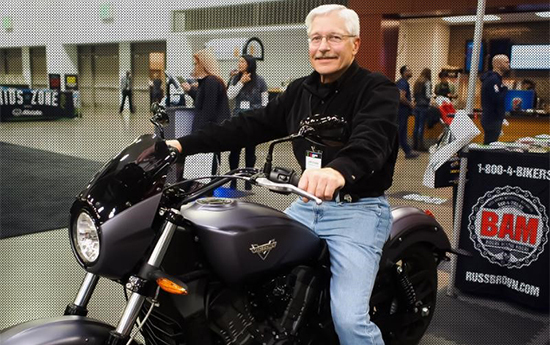 Moments before he would finally see his brand new prize ride in person, we met up with Larry and his equally excited son-in-law and grandson outside the convention center in Minneapolis to chat. Check out our blog on it here!